Eleven new titles make their debut across WiiWare, DSiWare, and the Virtual Console this week, with performances by Street Fighter Alpha, the arcade version of Shinobi, and a little Rayman for your DSi. 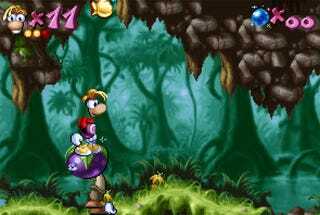 Kicking things off this week despite a startling lack of actual limbs is Ubisoft's Rayman (800 DSi points). Ubi has taken the original game and ported it to the DSi, forcing him to save his world from the dreadful Mr. Dark all over again, only this time around he can play against the clock to earn bonuses, which might include arms and legs. Probably not. Four other titles drop for DSiWare this week along with Rayman, including puzzle game Ball Fighter (500 points), local wireless capture-the-flag game Pop Island (500 points), action shooter Army Defender (200 points), and the red version of myNotebook (200 points). WiiWare keeps it low key this week, with four titles guaranteed to not get you all that excited. Yullaby's Magnetis (500 Wii points) is a puzzle game about creating electric explosions. Nocturnal Entertainment's Flowerworks (1,000 points) is a 20 hour-plus adventure game about a girl named Follie who loses a shipment of flowerworks seeds, whatever those might be. My Dolphin (500 points) is a dolphin training sim. As you can see, nothing too amazing, through Stop Stress: A Day of Fury (800 points), a game about beating things up with a baseball bat in the dreams of the world's most stressed-out man certainly sounds promising. Finally we have the Virtual Console, which gets the arcade version of Sega's Shinobi (800 points) and Street Fighter Alpha for the Super Nintendo (800 points). So Rayman, Stop Stress, and Shinobi are on my shopping list. What's on yours? Feel free to browse the full descriptions below to aid in your shopping adventure.